all on a sheet of paper. In my early teens I began to work toward a career in commercial art --ideally as an illustrator. I never knew anyone could make a living as a fine art painter so I thought a commercial career would be as close as I could get. However, all that seemed lost when, at age 17, a paralyzing spinal cord injury instantly changed my life forever. At first all I could do (literally) was shrug my shoulders. During my months in hospital I was forced to adapt and find new ways to do virtually everything imaginable. Even though I have never regained the ability to move my fingers, I eventually recovered to the point where I could move my left arm enough to write, draw and paint once again. The ability to express myself artistically was indispensable to my recovery and every day thereafter. Despite being in a wheelchair since 1972, I can still go anywhere I like by jumping into one of my magic windows. I might wander down a country road toward a forgotten bridge or country store. The next I may be exploring an abandoned Victorian house, a church or an imaginary castle. Art continues to be my all access" passport to discovery. The places I visit are sometimes real, often imaginary or a combination of both. Regardless, I hope youll feel youve been there before! · Walt Disney Company Since 1990, the Disney company has commissioned Randy to create paintings featuring their world famous landmarks and characters. Disney reproduces his paintings as limited edition prints and other collectible merchandise which they feature in various locations throughout their theme parks, resorts, and galleries. His works --when available-- also appear on the Disney.com website. His paintings have been transformed by Disney into limited edition prints and posters as well as such things as greeting cards, Bulova carriage clocks and watches, limited edition pin sets, expensive Limoges (fine china) dinnerware and other collectible items. 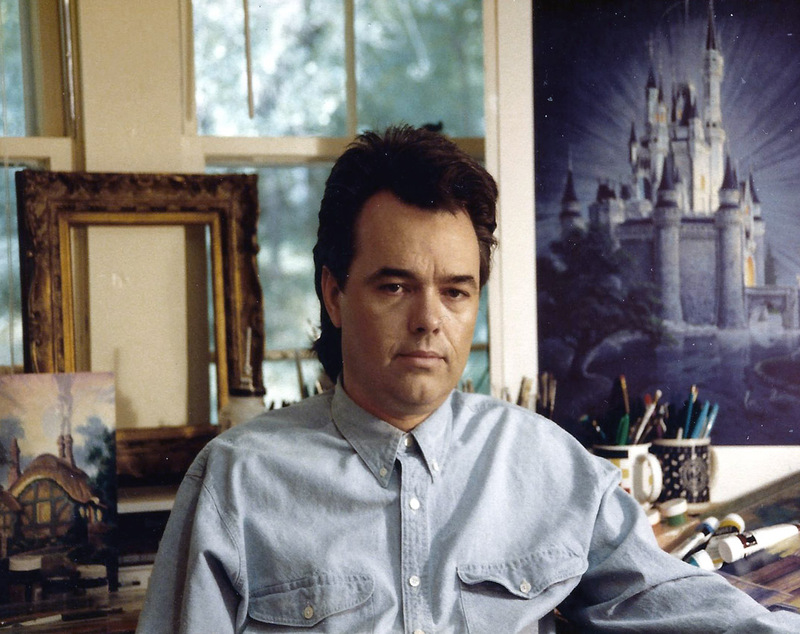 He also the only artist commissioned to create the limited edition poster for each and every Official Disneyana Convention. That was an annual gathering of approximately 2,000 Disney enthusiasts from around the world. Collector demand at this event was so strong that his posters typically sold-out within 48 hours or less. · Kraft/ General Foods Randy created two paintings that were featured on over 3 million Maxwell House collectible coffee cans. Each featured a special label and color insert offering a coffee mug with the same painting. Proceeds benefited Very Special Arts. A congressional reception was hosted in the LBJ room at the US Capitol building. 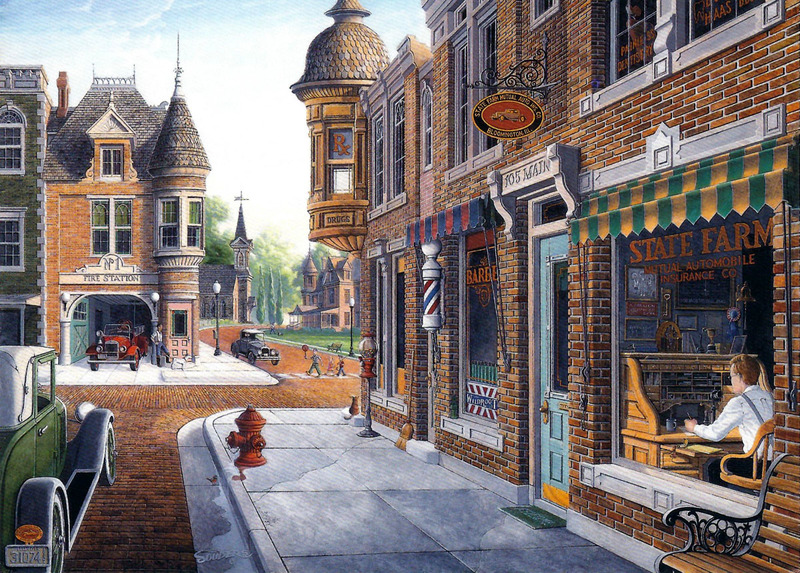 · State Farm Insurance Beginning in 1993 Randy was commissioned to create a series of "Good Neighbor" paintings featuring nostalgic scenes of Americas heartland. One entitled Main Street Memories was created their annual agency sales program. He provided them with approximately 10,000 framed and boxed prints (10 semi-trailer loads) which were awarded to agents who achieved performance goals set for the year. State Farm featured the image on the home page of their website. They also created various other collectible and promotional products. Notably, they engaged the Department 56 company to create a reported 50,000 3-D lighted versions of Randy's painting which were made available to their agents --slightly above cost we were told-- as premium gifts to clients. The series reportedly sold out rapidly and a second version of "Fire Engine No. 1" was also created based on that one painting. · MGM Grand Hotel & Casino (in partnership with Turner Entertainment) Randy entered into a joint venture to create entertainment themed works based on imagery from the classic MGM movie library. 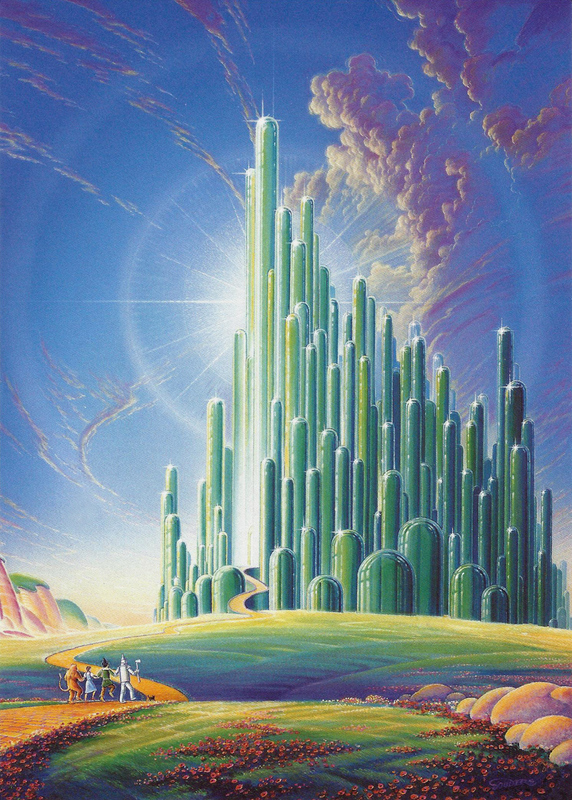 His first assignment was to create a definitive view of the Emerald City from the "Wizard of OZ" starring Judy Garland. 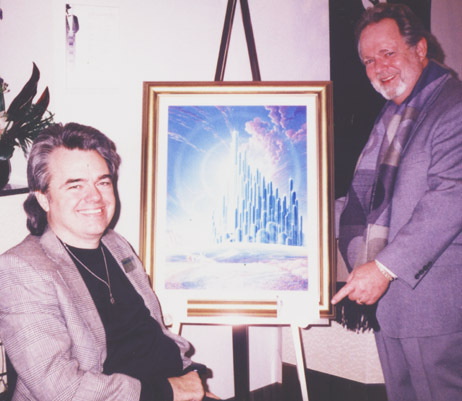 Randy is the only artist known to have been granted artistic license to paint the Emerald City from a side view. His painting was used to produce in a limited edition of 300 lithographs which were sold through "The Art of Entertainment Gallery" at the MGM Grand Hotel & Casino in Las Vegas. His painting "formally approved" by author Roger S. Baum, the great grandson of OZ creator, Frank L. Baum. · Capitol Records Randy created the cover art for a two CD set featuring a revival of the Broadway production of "SHERRY!" The musical was written in 1967 by James Lipton (host of BRAVO's "Inside the Actor's Studio") and is based of the classic 1942 screwball comedy "The Man Who Came to Dinner." Nathan Lane assumes the role of the world famous gossip columnist "Sheridan Whiteside." The overbearing, bombastic Whiteside takes a nasty spill on the icy steps of a midwestern household and proceeds to commandeer everyone and everything for the duration of his recovery. Lane also performed this role on the PBS series "Stage on Screen." Others in the cast included Carol Burnett, Mike Myers, Bernadette Peters, Tommy Tune, Phyllis Newman and Tom Wopat among others. This two recording is published by CAPITOL-EMI's Angel Records label. 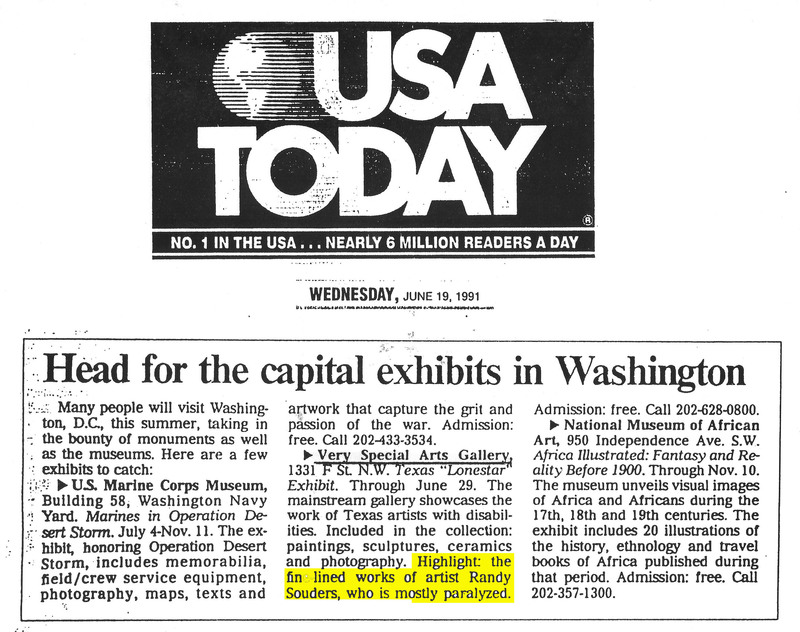 · The John F. Kennedy Center's "Very Special Arts" From 1990 thru 2005 Randy served on the national board of directors of VSA Arts (formerly known as "Very Special Arts"). VSA it is an educational affiliate of the John F. Kennedy Center for the Performing Arts in Washington, DC. VSA was founded in 1974 by JFK's sister, Ambassador Jean Kennedy Smith, with the purpose to provide arts and education programming for youth and adults with disabilities around the world. During his time he helped oversee their organizations across America and in as many as 90 countries worldwide. VSA annually serves over 7 million people of all ages and abilities who, through VSA programs, participate in every aspect of the arts  from visual arts, performing arts, to the literary arts. Randy's fellow board members included a "who's who" of some of the best known people in the arts, politics and corporate America. VSA won an Emmy Award for its production entitled "From the Heart." 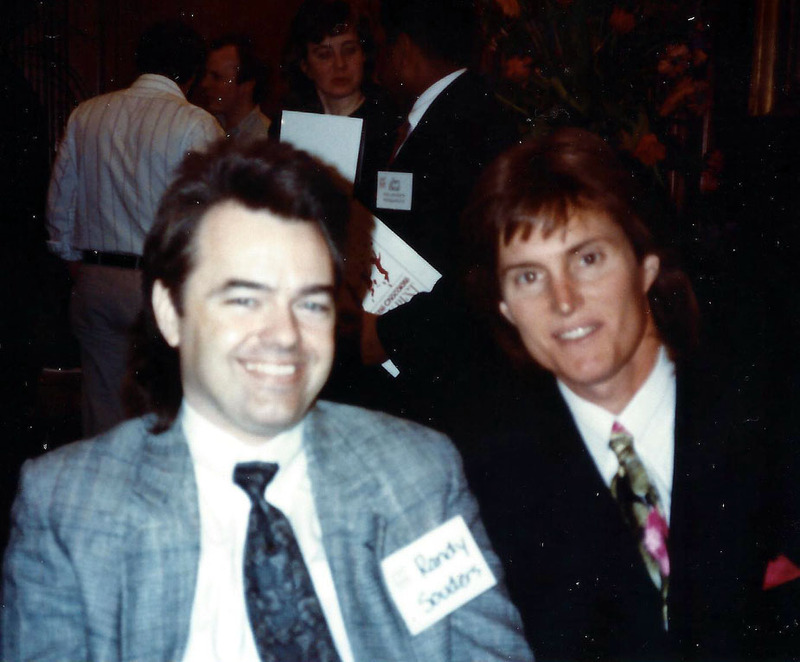 Randy was featured in two nationally televised programs VSA documentaries produced by Kara Kennedy Allen. She filmed Randy in Washington DC, New York, at Disneyland and in his Fort Worth studio. The films were entitled "FREEDOM OF EXPRESSION I & II." The first was hosted by Academy Award winning nominee and Golden Globe winning actress Marsha Mason. The second film was hosted and narrated by Faith Daniels --former talk show host and anchor of the "CBS Moprning News." · Chronicles of Courage Randy was profiled in the book "Chronicles of Courage" published by Random House. He was interviewed by his friend and patron Jean Kennedy Smith (former US Ambassador to Ireland) and renowned journalist, author, literary editor, the celebrated co-founder of The Paris Review, occasional actor, movie star and television personality George Plimpton. Together they co-authored the book. 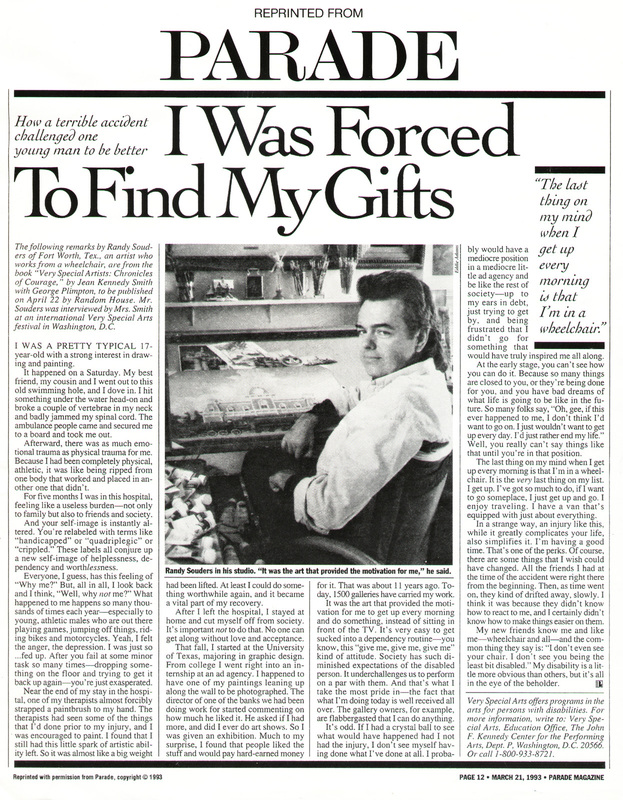 A full page excerpt from Randy's story was published nationally in PARADE Magazine (click to read the article). At the time, PARADE enjoyed a weekly readership in excess of 80 million nationwide. He was photographed in his studio by Pulitzer Prize winning photojournalist Eddie Adams. · "An American Collection" Randy was commissioned to create a painting commemorating the 200th anniversary of Washington as the United States Capitol. This painting is still touring the world as part of an exhibition entitled "An American Collection" To date, it has been exhibited at the Royal Museum in Tokyo, the Hanoke Museum in Japan, the Royal Museum in Brussels, as well as in New York, San Francisco, Alabama, Connecticut and many other museums and venues. · Art in Embassies Program Since 1992, Randy was selected to participate in the US State Departments Art in Embassies program. Ambassador Jean Kennedy Smith requested one of his paintings to be on exhibition in the US Embassy in Dublin, Ireland. Randy received letters of appreciation from President Clinton, Vice President Gore, Secretary of State Warren Christopher and others. · Yamagata Fellows Institute Randy has been a 5 time juror of the prestigious international Yamagata Fellows Institute for visual arts (a collaboration with the Corcoran Museum in Washington, DC). Each year the three person jury selected candidates from around the world to come to the United States for study and artistic collaboration. · International VSA Festival Randy was a representative of the United States delegation to the 1991International Very Special Arts Festival in Taipei, Taiwan (Republic of China). In addition to exhibiting his artwork, he was a featured speaker and trainer to several hundred delegates in attendance. · Call to Rise Randy was a co-founding member of the Call to Rise exhibition at the Orlando Museum of Art in Florida. 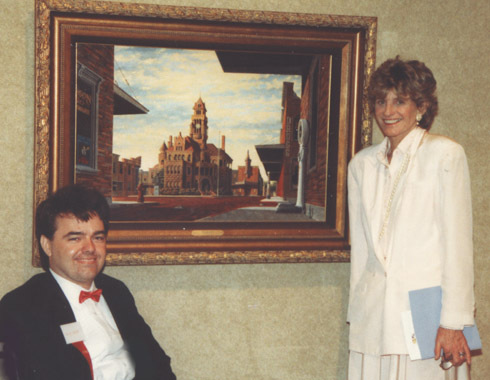 The event was sponsored by Humana Corporation and Very Special Arts and attended by VSA founder Jean Kennedy Smith (seen here with Randy). The jury included J. Carter Brown (longtime director of the National Gallery of Art), Barbara Haskell (curator at the Whitney Museum of American Art) and internationally known contemporary artist Frank Stella. Mr. Souders was selected to have a painting included in this prestigious exhibition. 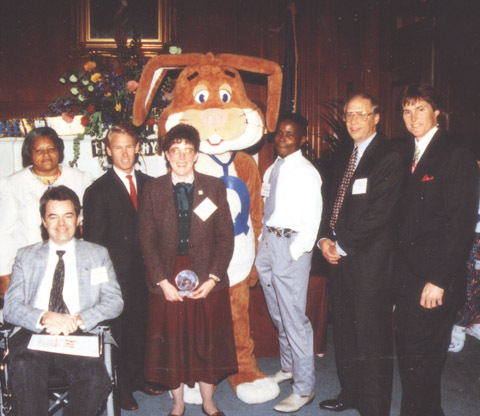 · Nestle´ Very Best in Youth Program Randy served the juror for the Nestle´ Corporations Very Best in Youth program. This national program was established by Nestle´ to award scholarships and grants to young people and groups who had achieved excellence in arts, athletics, and community service. Randy attended the official ceremonies at the US Capitol as the guest of Nestle´. His fellow jurors included Olympic gold medalists Bruce Jenner and Bart Connor. · Putting Creativity to Work Randy wrote the forward to a new book entitled "Putting Creativity to Work." It is a career guide for people with disabilities who seek employment in the 110+ arts related professions the book outlines. The disabled community suffers an astounding unemployment rate of over 70%. This book seeks to help remedy that awful statistic. It was produced by VSA Arts and published by the Social Security Administration. Special thanks to American Express for their support in underwriting this worthy project. Click here for to read the FREE version online. 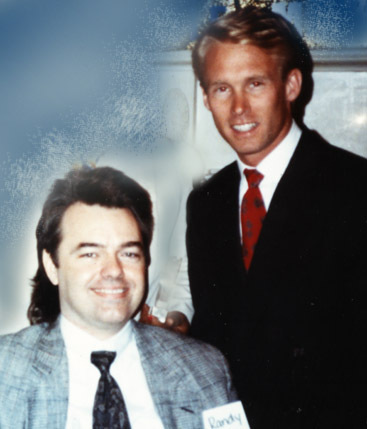 · Christopher Reeve Paralysis Foundation For several years Randy lent his artwork to the Christopher Reeve Paralysis Foundation. His last project involved the publication of 3,050,000 (three million, fifty thousand) calendars featuring his images. These were mailed to supporters across America and around the world. Proceeds assisted researchers in their quest to find a cure for paralysis due to spinal cord injury and disease. Randy Souders suffered a spinal cord injury in 1972 and has been confined to a wheelchair ever since. The CRPF designated Randy as being one of their "Heroes for Hope" and featured ed his story on their website. Randy has been featured in dozens of newspapers including USA Today, the Dallas Morning News, Fort Worth Star-Telegram and many other state, local, and national publications. Randy has appeared in magazines such as American Artist, Southwest Art, Art West, Art Business News, Collector's Mart, Collector Editions, Collector's Showcase, Decor Magazine, Prints Magazine, Southern Living, Texas Monthly, Texas Homes, Disney Magazines, Parade Magazine among others. Randy has been the subject of many television stories and news reports. In fact, two local news interviews were picked up and broadcast globally several times on CNN and CNN "Headline News." The latter ran his story every two hours for an entire day as their "Looking Up" feature. Collectors across the nation reported seeing these. One even saw it in an airport in Hong Kong. In the late 1990's Randy was an "on-air" vendor with the Home Shopping Network at their St. Petersburg, Florida broadcast center. At the time HSN was available to 90% of the homes in America. 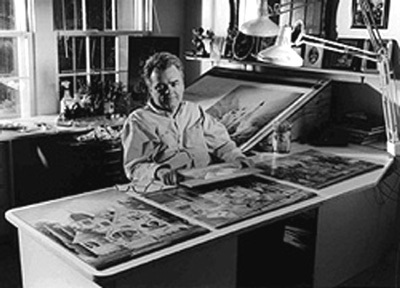 Randys works are to be found in the collections of the The Walt Disney Company, MGM Grand, State Farm Insurance, Maxwell House, Maytag Corporation, Norman Rockwell Museum (Philadelphia), Humana Corporation, Texaco, Texas Instruments, Southwestern Bell, Coca-Cola, Frito Lay, Harris Medical Systems, Continental Medical Systems, Dallas Rehabilitation Center, Cooks/ Fort Worth Childrens Medical Center, Texas Historic Foundation, Bank One, Justin Industries, Shield Medical, Sheraton Hotels, and many more. The White House, US Capitol, John F. Kennedy Center (Washington, DC), Texas State Capitol, Texas State Fair (3 million visitors), Orlando Museum of Art, Very Special Arts Gallery (Washington, DC), International VSA Festival- Taipei, Taiwan; University of Hawaii, University of Texas, at every "Official Disneyana Conventions" (Florida & California), -- plus over 300 gallery events, public exhibitions, and one-man shows. All names, titles, trademarks, images and likenesses are the copyrighted property of their respective owners. They are used here for informational and historical purposes only.